Make your reservation for a dorm bed through our website and receive the Internet rate, a savings of at least 1.00 per person off the regular rate. Rates include all linen, and free tea and coffee. Also, we do not charge a fee when you pay with a credit card. We also have weekly rates and other specials when you make your reservation through our website and our website only. 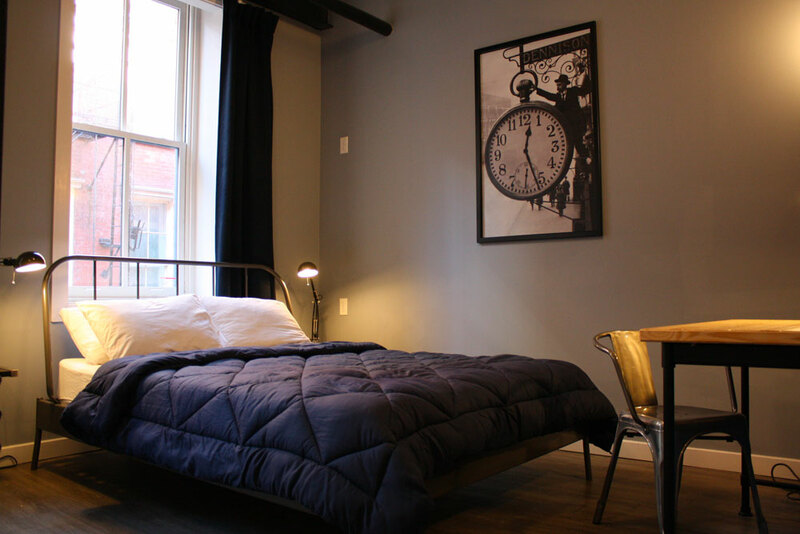 Apple Hostels Philadelphia is an independently owned affiliate of Hostelling International. 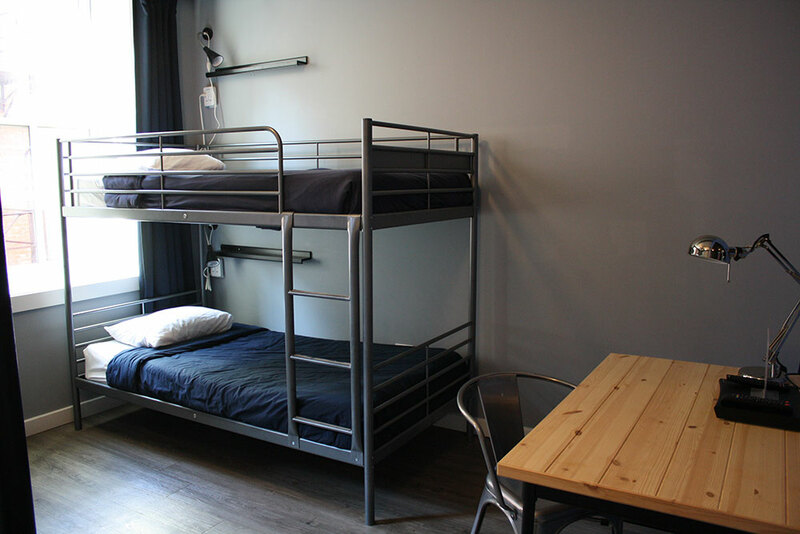 So while we are certified by Hostelling International and meet all of their standards, we do NOT require non-members to pay the daily membership fee of $3.00 per night. A membership is NOT required to stay at our hostel. ISIC and IYTC cardholders receive a $2 discount per night on dorm beds when they present their cards upon check in. We have Male, Female and Coed dorm rooms. 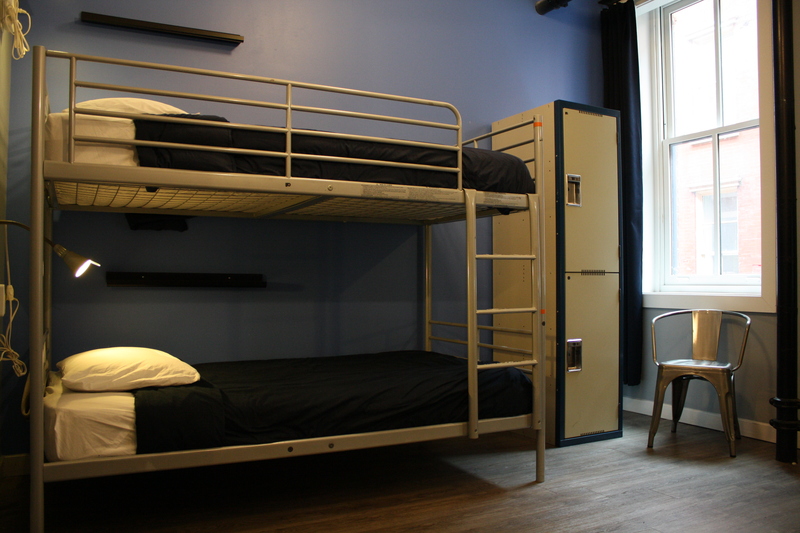 The 6-bed Coed dorm rooms are only for women or women traveling with men. Our 18-bed female dorm and our 10-bed male dorm room have ensuite bathrooms. The showers and bathrooms for all of our other dorm rooms are located in the hallway. The Coed dorm room is for women or women and men traveling together. Men not traveling with women are not permitted to check into this room. Women are always permitted to select this room. A Private room with bunk beds has one set of bunk beds, a chair, small desk and a small TV for watching a DVD from our extensive DVD collection. There is no bathroom in the room. The showers and bathrooms are located in the hallway. Depending on which room you are assigned, the men’s bathroom and showers may be located one floor above you. We don’t assign rooms until the day of arrival. The room rate is for one or two persons. Maximum 2 persons per room. 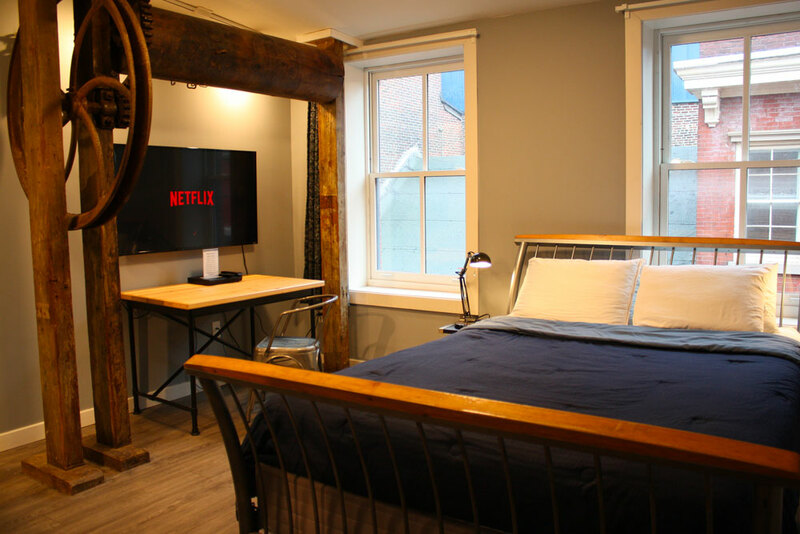 A Private room with Queen bed has one Queen bed, a chair, desk and large TV for accessing your Netflix account or watching a DVD from our extensive DVD collection. There is no bathroom in the room. The showers and bathrooms are located in the hallway. Depending on which room you are assigned, either the men or women will have to go to a different floor to find a bathroom or shower for their gender. We don’t assign rooms until the day of arrival. The room rate is for one or two persons. Maximum 2 persons per room. A Family Room has one Queen bed and one set of bunk beds, so it can sleep up to 4 people. Although it is ideal for families, you don’t have to be a family to reserve it. The room also has two chairs, a desk and a large TV for accessing your Netflix account or watching a DVD from our extensive DVD collection. There is no bathroom in the room. We only have two Family Rooms. One is located on the 4th floor and is our favourite room because it is very unique. It contains the original 19th century elevator sheave from when our building was industrial and they would use it haul materials up and down. The downside to this room is that it is located on the 4th floor, which only has men’s bathrooms and showers. Women will have to walk down to the 3rd floor to access showers, sinks and toilets. Our 2nd Family Room is located on the 3rd floor. The 3rd floor has both men’s and women’s showers and bathrooms. We don’t assign rooms until the day of arrival. The room rate is for 1 to 4 people. The Male Private Room is very small and has one set of bunk beds. The room is located in a 10-bed male dorm room. The male bathroom (including showers) is located on the same floor not far from the room. This is ideal for those who don’t mind being in a dorm room but would like to have some extra privacy. It has a locked door that only the occupants of the room have access to. Reservations for this room are only taken over the phone and only bookable 5 days in advance, as we try to save it for groups who may be reserving the entire 10-bed dorm room. It is located on the 4th floor.